Aahh… the so enticing Margarita. Just pronouncing it – mar-ga-rita – brings a smile to your face. It conjures thoughts of chips and salsa, fresh home made tortillas, mariachis and good times. It is, after all Americas most popular cocktail. So much so that we even have a National Margarita Day. Now you don’t need to wait for a special holiday or occasion to mix one up. Why not bring out the bartender in you and try making one at home. Its easier then you think. Yes there are quite a few Margarita recipes out there. You have your Blue, Golden, Frozen, Strawberry, Banana and Mango Margarita. But nothing beats an original Margarita from scratch. I guarantee your guests will come back for more. I always use fresh ingredients and serve it on the rocks never blended. Just fresh squeezed key limes (2 oz), simple syrup (1oz), Triple Sec (1/2oz), and of course a 100 percent blue agave blanco tequila (1 ½ – 2 oz). Shake it in a shaker with ice and pour it in a salt rimmed glass over ice. 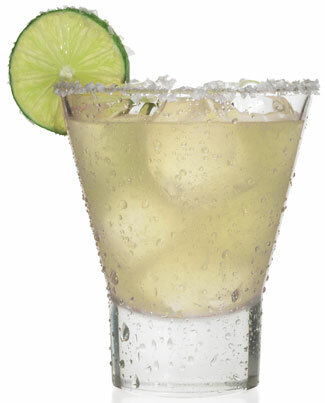 Make it a Cadillac Margarita with a splash of Grand Marnier or Patron Citronage. Never use mix or sweet and sour. Once you try it fresh I promise you’ll never go back to mix. I rather get cramps in my hands from squeezing a hundred limes for my guests then using bottled mix. Believe me I’ve broken a few lime squeezers in my Liquid Lab (my kitchen). To make simple syrup just boil 2 cups of sugar with 2 cups of water. Mix the sugar until the water is clear. Let it cool down, pour it in a bottle and place it in the fridge for your next Margarita. It will keep in your fridge for a month or more. The only “officially recognized” margarita by the International Bartender’s Association is the version served on the rocks with a salt rim. There’s debate over who invented the margarita, but a popular story has it invented in 1948 by socialite Margarita Sames. According to the legend it was during a party at her cliff side hacienda in Acapulco, that Margarita began looking for something cool to cut the dust of a hot afternoon. So she experimented by mixing Tequila Herradura, Cointreau and fresh lime juice.